Penang is a place close to our hearts. It is the wonderful place where we spent 6 months of 2015. We just love it. One of the up sides of spending so long on this Malaysian island is that we know it well. Below you will find our guide to everything you need to know about Penang with kids – where to stay, what to eat, how to get here and around, as well as the biggest and best list of what to do in Penang on the internet! This will be useful whether you are travelling with kids or not. 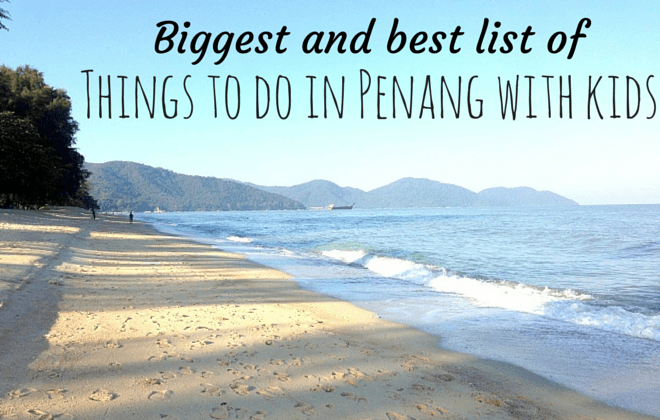 1 The biggest and best list of things to do in Penang with kids ever! 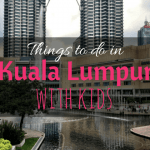 The biggest and best list of things to do in Penang with kids ever! 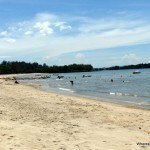 Wondering what to do in Penang, Malaysia? Wonder no more. Below you will find a list of 36 Penang attractions for kids. Most of these attractions also appeal to adults, so don’t think you need little ones to make use of this list. 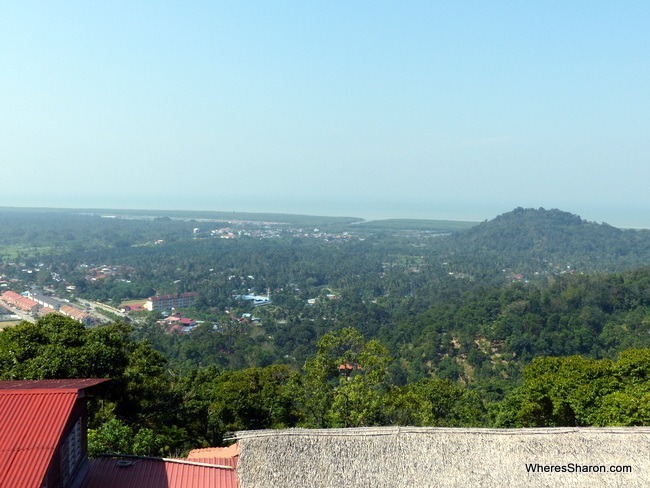 If you are looking for the must do attractions in Penang, I would say that Penang Hill and the funicular ride is the main activity in Penang that I would head to (whether you are with kids or not). 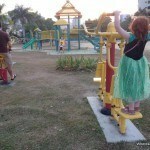 If you are looking for the number one activity to do in Penang for kids, head to the Youth Park. This is our favourite place. The biggest two slides – I dare you to do that drop! This fabulous indoor playground is located in Batu Ferringhi at the Golden Sands Resort (but is open to the public as well). The main point of difference between this and others is the three fabulous and fast drop slides. There is also a specialised toddler play area. More details to come. This beach is great for families – well mostly. It is clean, nice and calm and I never saw it very busy. You can check it on in the top photo on this page. The problem is that although the risk of jellyfish stings is meant to be low – I was stung the first time I went in! So this is something to keep in mind. 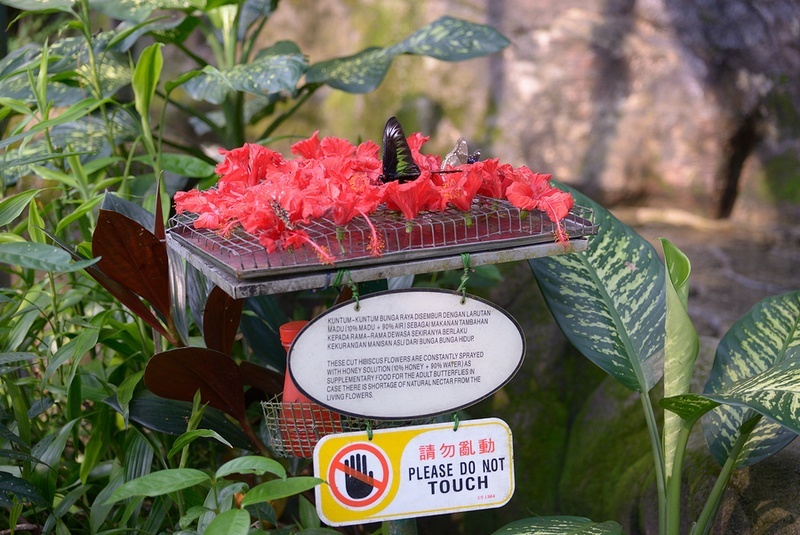 This small butterfly farm with insect displays is in a lovely spot near Batu Ferringhi. There are many butterflies, as well as other animals such as lizards, turtles and fish. The museum part has informative displays. Be warned that this place is great, but small. We spent only 20 minutes here. Please note: This butterfly park has since reopened and is now bigger and better. You will need more than 20 minutes now. Thanks reader Narelle for providing this update. You can find more information here. This was a must do for us! 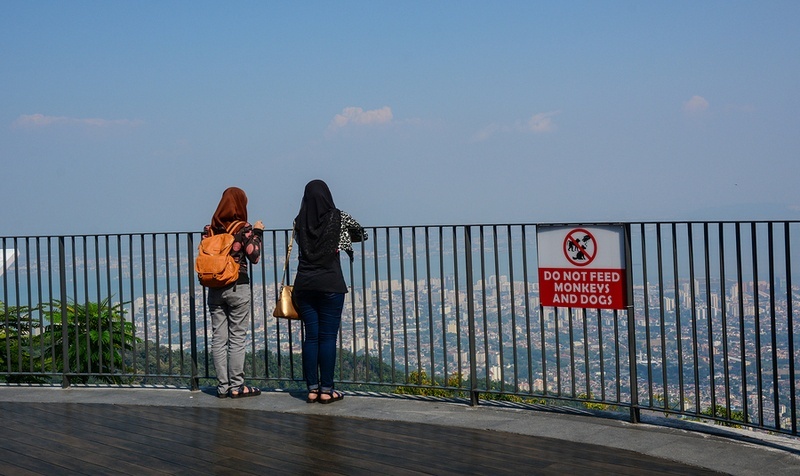 You basically catch a funicular tram ride up to the top of Penang Hill where there are views, some things to do and plenty of places to eat. The tram ride is fun (we all loved it) and even a bit thrilling on the way down. You definitely need to sit at the bottom of the tram to get the full effect. For some strange reason this is easy to do as we were there at a busy time but the locals seemed to not to want to sit there. At the top, there are two food courts – one with food, the other with juice and icy treats such as awesome ais kacangs, an owl museum, temples, a playground and some other minor attractions. The kids absolutely loved the playground, and I was a fan of the Hindu temple. It was very tranquil standing in the cooler temple air, surrounded by chanting on the top of the hill. My only complaint is that the views were not very good. There are lots of trees which is awesome, but it did hide much of the view. More details here. Current price RM30 for adults and RM15 for kids 4-12. There are lots of family discounts. 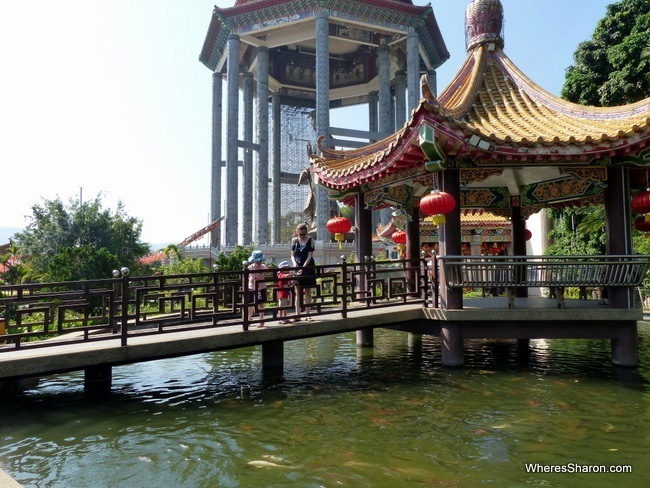 One of our favourite things to do with kids in Penang is visiting Youth Park. This massive park is always a huge hit – we just love it! There is a massive playground, many different areas with exercise equipment and lots of different pools – this is just one area in the photo. There are also trails into the surrounding jungle. One of the best parts of this park (other than being free) is that there are lots of trees. The abundance of shade makes it a very pleasant place to hang out. Even if you don’t have kids, I think you would enjoy half a day here in the pool. There is also plenty of seating space, shops and toilets. It is close to the Penang Botanical Gardens and we preferred this area far more to those gardens. There are also some monkeys here. 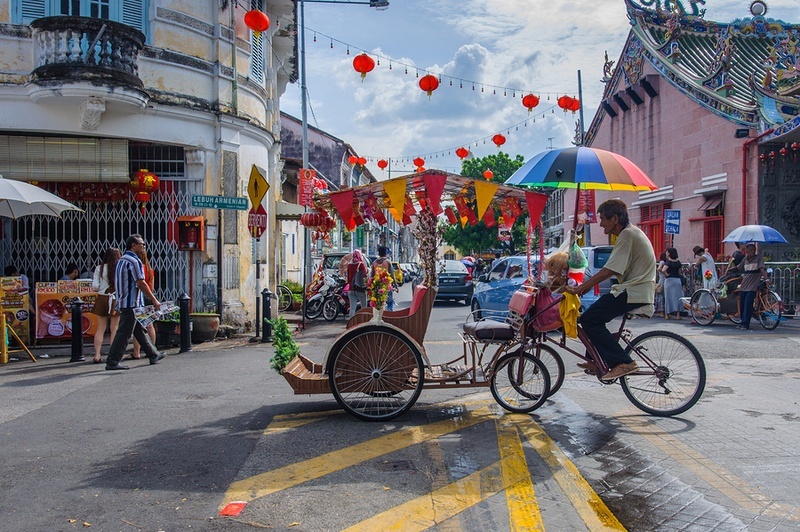 Reflecting the Chinese influence on the island’s development and history, Penang is one of the few places you can still ride by Trishaw – bicycle powered cabs. Sometimes called “beca” locally, these trishaws are a modern version of the human pulled rickshaws heavily used in Penang long ago. These days they are purely for tourists. You can rent trishaws for short trips or by the hour (for your own special tour) in Georgetown, around the historic centre and Little India. They tend to wander round and you can hail them on the street if you see them passing; rates vary but (very) short trips start at RM 10. In Batu Ferrenghi trishaws are available at night time, lightly lit up. Most will wait out the front of the Golden Sands hotel but some will go up and down Jalan Batu Ferrenghi. For RM 40 you can go from the Golden Sands up to the Holiday Inn and back (about 10 minutes) or for RM 60 they’ll take you further up to the western edge of the night market. It’s not a cheap trip but our kids loved it and there’s something relaxing and timeless about a taxi that goes barely faster than walking. This temple is the biggest Buddhist temple in Malaysia and the whole complex should definitely be on your list of what to do at Penang. It’s in a very picturesque setting against the mountains of Penang. There is the massive temple as shown in this photo as well as a pagoda and a few other temples. There is a pretty fish pond and some other nice garden areas. The whole area is very peaceful and I loved spending time here and so did the kids. It was a bit tricky working out where to park, but just keep going and you will get there. We parked right at the foot of the temple. There is an inclination lift that you can catch between the temples to avoid lots of stairs. It currently costs RM2 to go to the Pagoda for adults, RM6 to use the inclination lift and RM3 to park. The kids were free. Another kids activities in Penang is the Snake Temple. 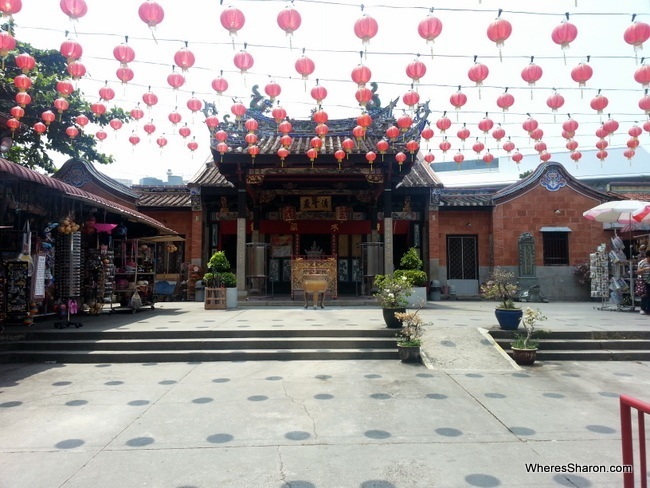 It is a small but traditional Chinese Buddhist temple in Bayan Lepas, near Penang Airport. It was built in 1850 by monk Chor Soo Kong, who legend has it gave sanctuary to snakes there. After his death, snakes came by their own accord. Snakes used to inhabit the temple but no more. There are two large snakes you can pay to pose with for photos, and a “snake breeding area” – a small fenced off area where young snakes are raised between the main temple and a secondary temple out the back. While the temple is ornate, without the snakes it is not particularly unique or noteworthy. Buses to the airport (such as routes 102, 306 and 401E) go past the temple and there are places to eat and buy drinks adjoining the temple’s car park. Driving to the temple is straightforward (just look for the signs as to where to turn off) and parking is free and easy. Entry is free, although there is a small donation box. Driving down the Western part of the island is a very different experience to visiting the rest. The small road is very winding and picturesque as you drive through the jungle and farms with many durian stalls. The high rises that are present everywhere else on the island are noticeably absent. It’s definitely worth the effort of making a drive around the island of Penang. These night markets are on the main road in Batu Ferringhi and are a great way to pick up some souvenirs after having a yummy dinner at Long Beach Cafe hawker centre. Another item on our list of things to do in Penang for kids is the Botanical Gardens. It is a beautiful place to chill. There are lots of trees and attractions and you are sure to love the monkeys which are scattered across the park (and not aggressive like the ones in Bali thankfully!). Entry is free and you can get here on the bus. I recommend not visiting around lunch time, not just because it is hot but because many of the enclosures shut down from 12:30-2pm. The pool area at the Hard Rock Hotel is great. There is a water play area for kids as well as pools including a sandy bottom pool. You can buy day passes as well as an annual pass which is great value for families who plan to spend awhile in Penang. Located near the entrance is the Forest Museum (entrace: 1RM for adults, kids 5+ are 0.50 RM). Unfortunately, it was almost all in Malay, but S and Z enjoyed it for a few minutes as we looked at the exhibits. Further up the main path there is a playground that, while small, kept the kids occupied for quite a while. And just beyond there is a series of small pools, made from a stream, that you can swim in. One even has a waterslide! When we went (on a Sunday) these were busy. Near the pools is a paid change room, if you need it. 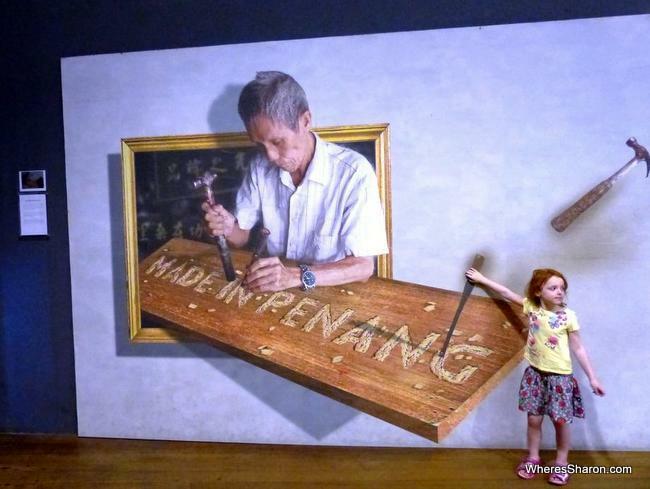 The Made In Penang Interactive Museum is somewhat of a misleading name. It’s not a museum really although it does highlight the history and culture of Penang. Instead of traditional museum exhibits, MIPIM uses “3D” (or isometric) art, where you’re encouraged to pose and put yourself into the work. Some works feature aspects of Penang’s history and culture, others are just for fun. On top of this there’s some great miniature scale models of old Penang, and a movie on Penang’s culture and history. S and Z were mainly focused on the artwork, though, and just wanted to pose in different scenes. The history and culture was a bit lost on them and they raced through it. There’s at least half an hour’s worth of entertainment – more if you’re not as fast as we were. If you don’t know much about Penang, its history and traditions, then this is a novel introduction. Adults are RM 15, kids are RM 10 (although Mr 3 was free). 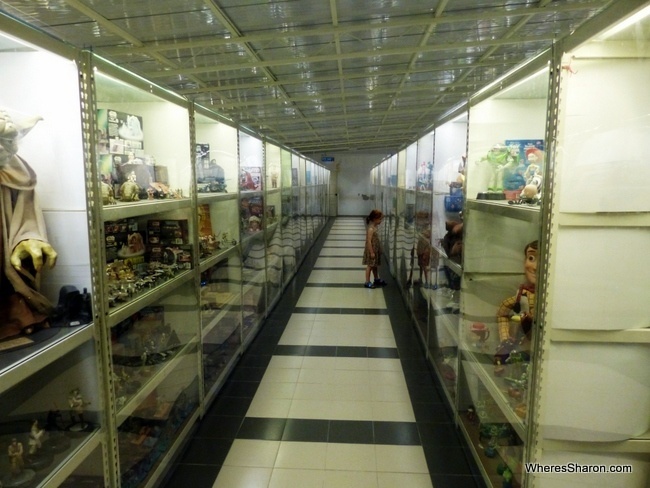 The Toy Museum and Heritage Garden (formerly the Toy Museum, Wax Museum, Handbag Museum and Heritage Garden), which claims to be the most expensive collection of toys in the world, is simple a small warehouse filled with display cabinets of toys, statues and collectibles. They cram a lot of toys in. The collection is very random and eclectic (Kiss dolls anyone? ), focusing mainly on merchandise from movies, Barbie dolls, and models of military equipment with no seeming logic to its order. My favourite item was the big Astro Boy. S and Z enjoyed looking at toys from movies or things they recognised, but the novelty soon wore off and it provided only half an our of entertainment at most.The bigger kids, and kids at heart, found it more interesting, and possibly the older you are the more you’ll get out of it (nostalgia’s like that). It no longer contains such attractions as a wax museum, although they still advertise that they do. We were quite annoyed by the advertisement they handed us a few days before we visited at another attraction which boasted of things that no longer existed and had the admission price as much cheaper than it was in reality – don’t be fooled!! The Toy Museum and Heritage Garden is located in Teluk Bahang. There is a small sign indicating the turn off 50m south of the big roundabout in Teluk Bahang, from there follow the sealed road which turns right not far off the main road and leads to a low, white, building with a small carpark. It is within walking distance of where the 101 and 102 buses terminate in Teluk Bahang. You can get entry into the toy museum and heritage gardens on the same ticket. It’ not cheap though – for non-Malaysians entry was 30 RM for an adult and 20 RM for children, even Z at 2 years old. 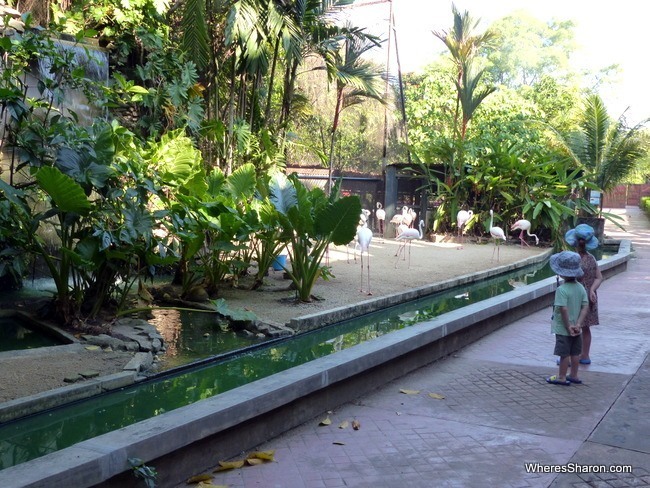 If you are looking for something else to add to your what to do in Penang with kids list, this fabulous bird park is located across the causeway in Butterworth. There are multiple aviaries, ponds and animals including many types of bird life, turtles and fish. We all enjoyed this park and it was bigger than we expected. The bird show was also enjoyable. The one downside was that a couple of birds were tethered. Admission is RM38 for adults, RM20 kids 2-12 and RM1 for a camera. It is an easy drive if you have your own car. Currently, the shows are at 11:30am and 3:00pm. This fort is by the sea in Georgetown. It consists of the old fort with many informational boards and a museum section (which is currently being improved). It covers a reasonable size area and doubles as a nice, peaceful park. S found it very interesting and loved looking at all the old photos of Penang. Entry is RM20 for adults and RM10 for kids (ours were free) which I think is overpriced. Still, it is a nice place to visit especially if you are a history buff. There are still car ferries that run back and forth between Georgetown and Butterworth. They run regularly and are cheap. We had fun catching it back and forth. Tickets are RM1.20 for adults, RM0.60 for kids (ours were free) from Butterworth to Penang. You don’t pay in the opposite direction. They run regularly. 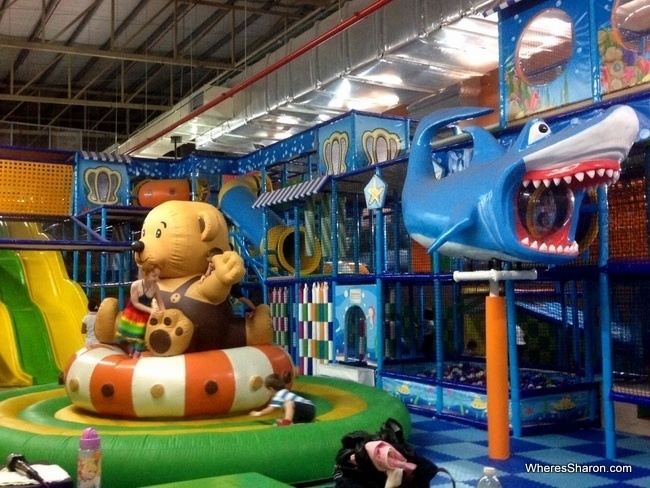 This great indoor play centre can be found in Queensbay Mall. It was an absolute hit with our kids. Too much of a hit in some ways as it was mission impossible to get them out (and they charge more if an adult goes in too!). It costs a whopping RM23 for kids and RM7 for adults. You can sit outside on one of two hard wooden benches and avoid the adult fee – I do find it weird that they want you to pay to supervise your kids! Our kids were fine without me in there and I did get a nice break so perhaps this is a good thing! This unique island is about an hour and a half from Penang. Instead of finding orangutans in enclosures, you take a boat across to the island and then the humans walk through an enclosure while the orangutans can roam free. Escape is an adventure park with lots of rides and games for adults and kids. We never made it here as we worried our kids were too young to enjoy it properly. More here. The canopy walkways is a 250 metre long raised walkway in the Penang National Park. It is up to 15 metres high so gives you great views over the rainforest floor. 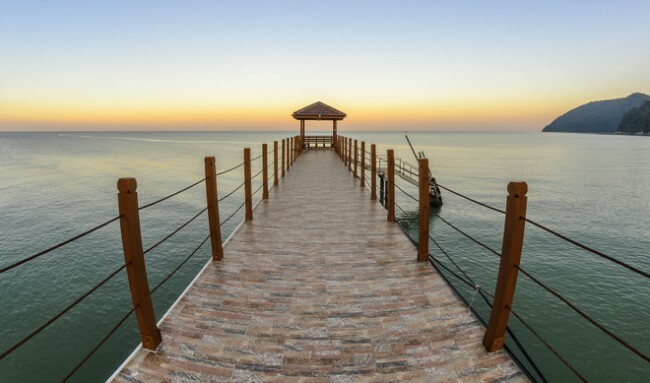 The walkway itself is located a kilometre inside the National Park. It’s an easy 20-30 minute walk along the coastline on a paved path. Make sure you buy tickets at the entrance to the National Park before walking to the canopy walkway itself. Monkey Beach or Teluk Duyung is located in Penang National Park. It’s a beautiful beach which is home to macaques. You can walk here or take a boat from the entrances of the National Park. There is a campground. It’s best visited on weekdays to avoid weekend crowds. Find more info and reviews here. On Kerachut Beach, in Penang National Park, is a lovely stretch of beach which is home to the Penang Turtle Sanctuary. It’s open daily and there is free entry. There are plenty of fish spas you can try out in the main street in Batu Ferringhi. There are many wet markets in Penang which you can find with a quick google. Here you can see and taste many varieties of tropical fruit from around the world. This is a beautiful 8 acre garden that you can visit, wander around or do a guided tour. There are also activities for kids. More information here. If you’ve wanted to try to big, smelly durian – here’s your chance! The Boa Sheng Durian Farm offers you tasting of this fruit and others. More information here. This fun water playground is located next to Straits Quay. You can find more details here. The Purrfect Cat Cafe is the purrfect choice for cat lovers. This cafe in Georgetown has food and drinks and cats to play with. More information here. Please note that there is an entry charge. This zoo is not in Penang itself but is an easy day trip away in Taiping. There is also a night safari. You can read more about it here. It is located not far from Orangutan Island. 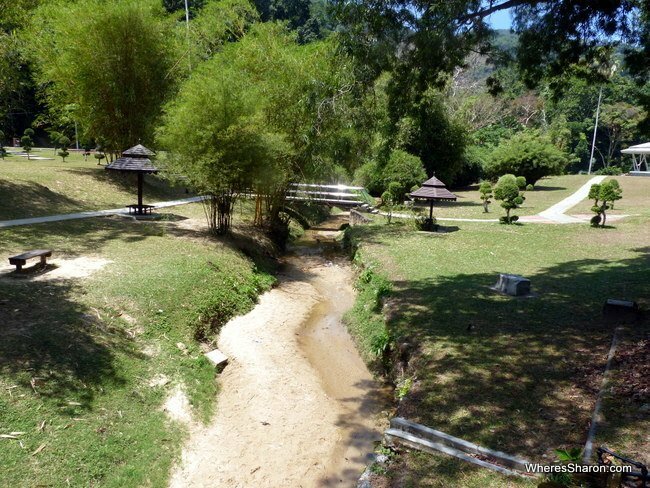 If you want to cool down, this park is about an hour’s drive from Penang and looks like lots of fun! More information here. There are some fabulous hotels in Penang. The first thing you will need to decide is which area to stay in. The most popular choices (and where you will find the best hotels in Penang) are Georgetown and Batu Ferringhi. Georgetown is the capital and is a nice place to wander with old colonial architecture and old communities. There are also new shopping centres and it is where the ferry goes across to Butterworth which can make this a convenient stop. There are also buses to many parts of the island. However, I have found the streets to often be deserted and it is not somewhere I felt comfortable walking alone at night. Batu Ferringhi is a beach town about 45 minutes from Georgetown (this can vary a lot depending on traffic). It consists of a main strip with a night market and many restaurants, hotels and services catering to tourists. It is a very nice place to be and we have absolutely loved living here. There are tourists around (although nowhere near as many as you will see in equivalent towns in Thailand), so this can be a turn off for some. It is more relaxed in Batu Ferringhi and this is where you will find most Penang resorts for families as well as the best beach hotels in Penang. For another alternative, stay along the main road in Tanjung Bungah or Tanjung Tokong. These suburbs are in between Batu Ferringhi and Georgetown and will allow you to get to either option easily. Many are by the water and there are many Penang family hotels here as well. 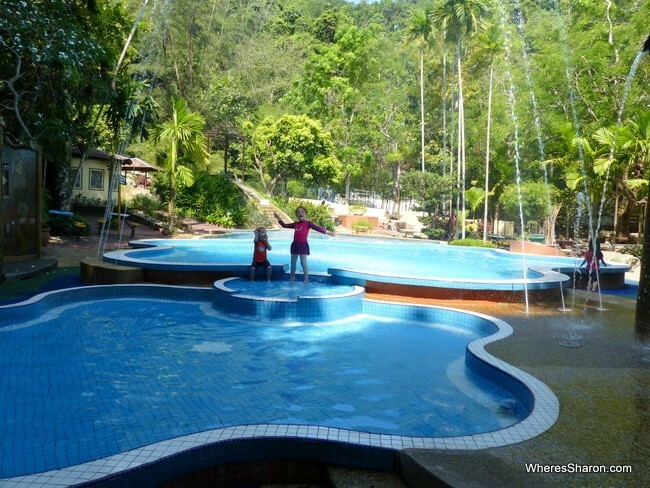 Golden Sands Resort, Batu Ferringhi, Penang – this resorts and its facilities just scream family fun. We absolutely loved our time here right on the beach and we think it is the best family hotel in Penang – Check latest prices – Read my review. Shangri-La’s Rasa Sayang, Batu Ferringhi, Penang – this 5 star resort next door to the Golden Sands is just heavenly and perfect for families or couples. It would be our pick for the best resort in Penang especially if you are wanting to relax in a great location – Check latest prices – Read my review. 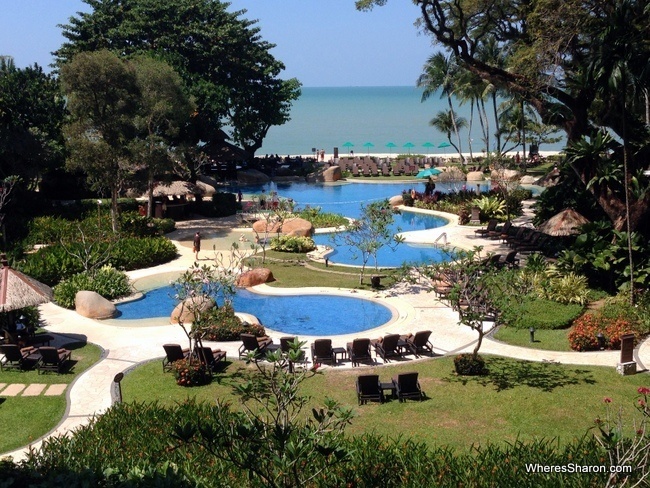 Bayview Beach Resort, Batu Ferringhi, Penang – this resort right by the beach in Batu Ferringhi is incredible value with rates often starting at well under US$100. There is a fabulous big pool, kids’ pool, kids club and our favourite part – the kids’ water playground. 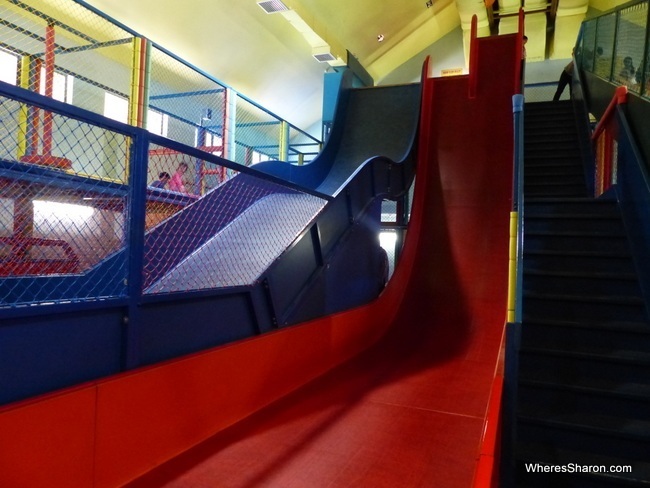 Our kids spent hours playing here – Check latest prices. 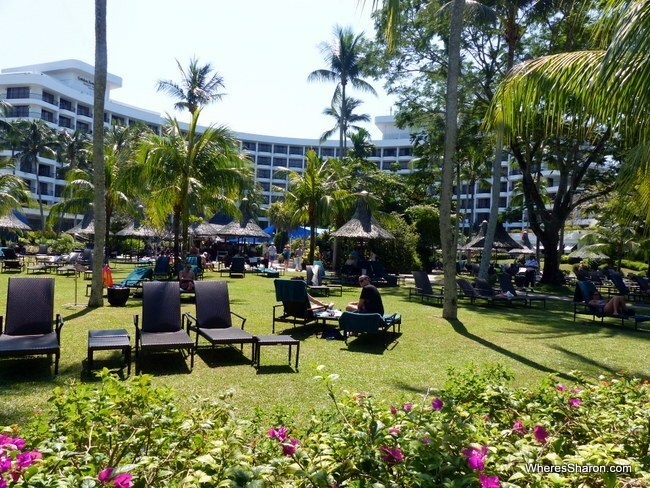 Holiday Inn Resort Penang – this resort, in a fabulous location by the beach in Batu Ferringhi, has our favourite family rooms in Penang and friendliest staff. 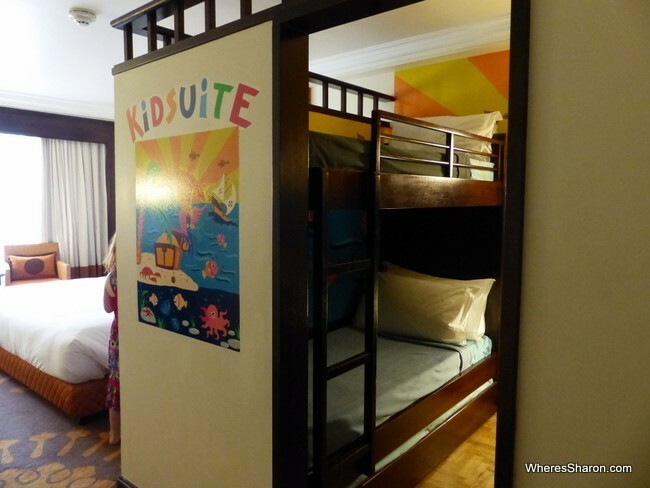 The “kid suites” are just fabulous with a separate kids’ bunk bed area and themed rooms. The kids also enjoyed the kids’ club which has long opening hours – Check latest prices. Flamingo by the Beach, Tanjung Bungah, Penang – this is a great hotel by the waterfront in Tanjung Bungah. There is a large pool, kids’ club and it is in a great location with our favourite Indian place, Sri Ananda Bahwan, across the road – Click here for the latest prices. Cititel Hotel, Georgetown, Penang – located in a great spot in Georgetown, this is one of the best Penang hotels in this area – Check latest prices. You can also read our full list of the best places to stay in Penang. Penang is known as the food capital of Asia and the food here is absolutely superb. There are so many great places to eat particularly if you love Malay, Chinese or Indian food. There are many other options as well, and you will never have to worry about where to eat in Penang – you will have no problems finding something to fill your belly. Food is not just delicious, but very good value. We eat out a lot and it rarely costs very much. If you eat at a local restaurant, you will pay around RM5-10 per meal. Hawker centres (a collection of food stalls kind of like a food court) can be even cheaper although keep in mind the quality of the food generally goes down if you pay less than this – there won’t be much meat and vegetables added. Shopping centres have some great restaurants which usually cost closer to RM15+. Click here to download a PDF version of this guide! Many food options are spicy. If this is an issue for you, be sure to ask for it to not be spicy. Dishes also change regularly. You can order something one day, come back and order it the next day, and it can suddenly be spicy so just keep asking for non spicy options if this is what you need. Long Beach Cafe – Hawker centre in Batu Ferringhi. It is hard to beat the options and the quality of food at this centre. You could eat here for months and not get bored, there are just so many options. This is my pick for the best place to eat in Penang. Options start at RM3. Golden River Restaurant – Chinese in Batu Ferringhi. About RM10 per meal. Zarie Laksa House – Malay in Batu Ferringhi. Options start at RM5. Ferringhi Inn and Cafe – Indian and Western in Batu Ferringhi. This is where we go if we need a pizza or pasta fix. Expect to pay about RM15-20 for a meal. They also do quick and easy delivery. Bora Bora by Sunset – Western and Malay food in Batu Ferringhi. Great option right on the beach. We all loved it as the kids could play in the sand while we waited. RM12+ per meal. Also a good option for a drink. Sri Ananda Bahwan – Indian food in Tanjung Bungah. Its reputed to have the best Indian food on the island and I believe it! A definite place to go if you love Indian. RM5+ per meal although you are looking at RM10 for a bowl of (absolutely delicious) curry. Sakae Sushi – Japanese sushi train restaurant in various locations. We tend to go to the one in the Tesco centre in Tanjung Tokong. It’s delicious and they have tablets at the tables to make it super easy to order. Annalakshmi Temple of Fine Arts – Indian Vegetarian in Georgetown. This great place has good food in a garden setting. It also has no fixed prices – you can pay what you feel the meal deserves. Saturday evening from 6pm there is a special buffet. If you are looking for some more options, here’s a great list of vegetarian restaurants in Penang. All the above cater to vegetarians as well (I was one when we lived there). Penang is a major population centre and a major tourist destination, so it is very easy to get to Penang. The two main options are by bus and plane, although you can also get a train to Butterworth then catch a ferry across to Penang. Buses come to Penang from many destinations, and it should not be difficult to get one here from most places in peninsular Malaysia. There are many flights to Penang, although most go from Kuala Lumpur. You can also fly to Singapore, Indonesia and Thailand directly. There is a good system of buses in Penang which makes getting around between the main areas easy. There is even a bus that goes all the way from the airport to Batu Ferringhi (warning: this does take two hours!). You can see all the latest timetables and routes here. There is also a tourist hop on and hop off bus which is handy for people without much time. Taxis are good value and readily available. I use a smart phone app, Grab, which makes it very easy to book taxis and understand what the rates are. It is also very affordable to hire a car and we find it an easy place to drive. We rent our car through Magic Green Rent-A-Car. They have been fabulous to deal with and have great rates. 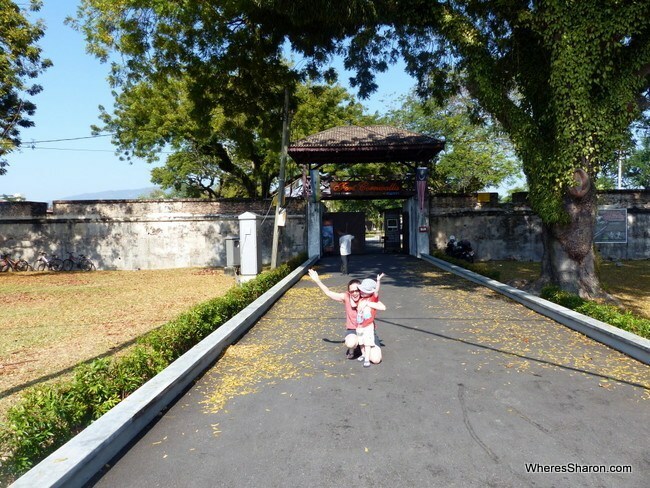 Penang is a fabulous destination for kids – ours just love it! 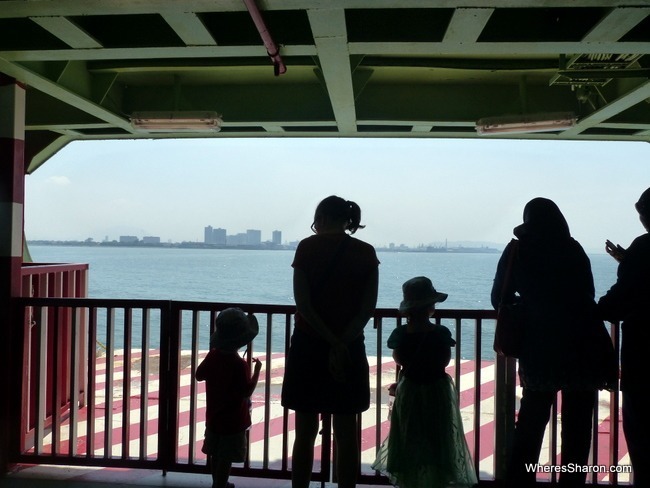 There are lots of attractions and kids’ activities in Penang to keep them interested, there is an abundance of great food, they are going to preschool that they love… It is all just so easy here for families. The local population is very welcoming of families. We always feel comfortable and at home. They are also used to foreigners so we also don’t have to deal with too much attention – if you have a red headed kid you will know why this is such a good thing! Penang is just such a nice, easy and delicious place to be! We love just hanging out here whether it be at Youth Park, a bird park, the beach or in a hawker centre. We love it so much that we cannot keep away – we lived here on three separate occasions in 2015. We hope this guide we help you to enjoy it as much as us! You can also read our guides to nearby Langkawi and Taiping or find all our Malaysia guides here. Disclaimer: This article contains affiliate links. This means that if you make a booking after clicking on one of these links then we may receive a small commission at no extra cost to you. Thank you for supporting our blog. I think you’ve made a pretty thorough list! I love the butterfly farm. You can hold millipedes or centipedes or something. Gert pretended to take a bite out of it and the guy nearly had a heart attack. Get a free guide to take you through and explain stuff – they are standing around waiting! And go through slow – it’s not a huge place and you don’t want to be finished in 15 minutes! I love the botanical gardens in the afternoon. The gardens themselves do nothing for me – they are small and of no interest. But the monkeys, oh the monkeys! We went late one afternoon, about 4.30pm. We took food and walked to a sheltered area and we hand fed them and got photos with mums and babies up close. It was completely amazing since I’ve always loved monkeys. Probably naughty to feed them but I’d go there again in a heartbeat! Sounds fabulous! Were the monkeys at all aggressive? We are a bit frightened of them after they kept attacking the kids in Ubud! Good to hear the view can be better at Penang Hill. I kept wondering if there was another area to go as we couldn’t see much at all. There were no clouds but it was smoggy. We stayed at the Hard Rock Hotel – this is a great family hotel, partly due to that pool and the great rooms: Lil Rock Suites . We also really enjoyed the Tropical Spice Garden. This was a really good article. It is definitely bookmarked, and evernoted and all of that jazz. We’re moving our family to Penang as well sometime in the next few months, as soon as the house sells. So, we’ll definitely be using your guide to help us along. No problem! We are still here in Penang (although we leave for 4 months soon to travel but will come back), so let me know if you have any questions. Good luck with making the move! Yes, we’re looking forward to the move. We’re up in the air between whether we will go to Berlin for the Digital Nomad convention in July/August and then spend some time in Eastern Europe, or whether we would be better off going straight to SEA, and base ourselves out of Penang. We don’t plan on putting the kids in school so we expect our monthly expenses to be in the neighborhood of around $2,500 a month, assuming we rent a 3BR apartment for $500-700. Does that seem about right? How much are you spending to rent your car monthly? Around $300. And does that seem like it’s needed? I’ll definitely have to keep in touch if we need help figuring out what to do with all the curiosity of our ginger children. $2,500 should be plenty. We spend about $2,700, but we have preschool as well. 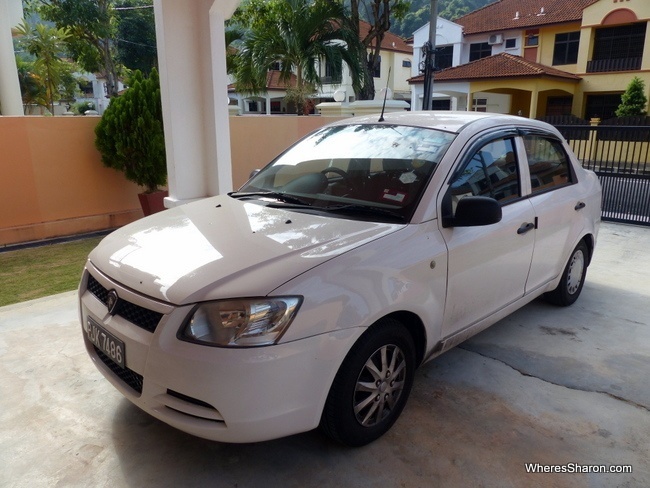 Car hire costs about RM1650 a month (just went up as they have brought in a GST here) which includes full insurance – which you definitely want. I have already been hit by a truck when we were stopped at a red light! We would not have one if it wasn’t for preschool. We couldn’t do that without a car. It is handy, but taxis and buses are cheap. your kids are lucky to have a very passionate mom like you, listng all this useful travel guides for kids…..
Sharon, hi! We are going to Penang with two kids for 3 months. Could you suggest a good place to stay? We prefer to rent an appartment but about the area we have no idea. )) Thanks in advance! The area depends on what you are after. We live in Batu Ferringhi which we love as it has a nice relaxed vibe and is more like a beach town whereas the majority of the rest of Penang is like one big city. The downside, though, is that we really need to drive to go to the supermarket or preschool. Everything else is in Batu though. 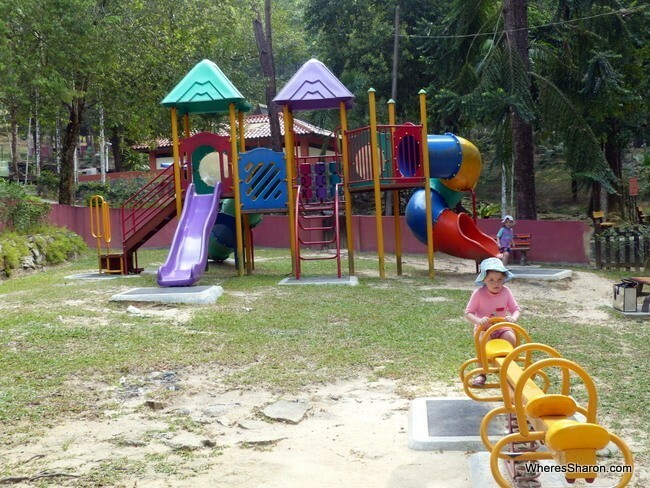 If we had been able to find a good rental deal, we probably would have gone with Tanjung Bungah or Tanjung Tokong which are in between Batu Ferringhi and Georgetown simply to save the drive to preschool. Are either of you working in Penang? Although the drive between Batu Ferringhi and Tanjung Bungah is no big deal, many other sections of the island have a lot of traffic, so I’d try to live near work. If not, Batu is a great area with kids. A good and well said about Penang and I have been there quite a few times but still not completed covering all the interesting places over there. Shall be back there again soonest. Wow! I’m going to send this to a friend visiting Penang soon. I’ll admit when we visited Penang we mostly hung out by the pool and ate too much! Of course, we still had an awesome time. (; We stayed at the Golden Sands and loved it too, especially the massive buffet breakfasts. We went to Penang Hill and I felt like it was definitely more for kids. I think the day we went must have been a school field trip because there were hundreds of kids there. The train ride up the hill was really cool though, great views at the top! Thanks for all the great info. We are heading to Penang next week, thinking we will stay for 3 or 4 months. How did you find your accommodation? And did you find it easy to find someone willing to rent for less than a year lease? We want to rent a condo in Georgetown, but many we are seeing look like a 12 month minimum. Thanks again. Hi Kate! we were lucky as we ended up renting through a friend and were able to come and go as we pleased. I met up with other travelling families in Penang though who had leases less than a year so that is certainly possible. Unfortunately, since I never looked myself, I can’t give good tips about who to use. When we weren’t in our house, we stayed in hotels and used Airbnb. Good luck! Unfortunately not. Hopefully Kate can help! Hello Sharon.. You have a great blog.. And I would like to ask.. How to get to bird park if we stayed in georgetown? Hi Ester! We drove but if you are not driving I think best way would be to get the ferry over to Butterworth and then take a taxi from there. Enjoy! We went to Penang recently and this ‘bookmarked’ page was so helpful. We spent a lot of time just chillaxing and will definitely be back since Penang is so convenient for us, what with our living in KL. No rush to the airport, no money changer stops etc. The Butterfly Park has now been renamed Entopia and when we went two weeks ago, it had just been reopened about a month before then. It is fantabulastic! One would certainly need more than 20 minutes at this new park. Really enjoyed it. Thank you for the guide and this useful list. Thank you Narelle, especially for the update! I’m glad you enjoyed Penang too. We miss it now we are back in Australia. You had a very good list of Penang attractions. I’m local Penang and I also found Penang is indeed a wonderful place. Even local like us also tour around Penang. You can search for this place. Saanen Dairy Goat Farm. Kids can enjoy close interaction with local goat. You can also got to Pulau Jerejak for relaxing or go to Jetties walk at town. There are also lots of new museum there too. Places like little india and Heritage trails walk at Georgetown. Hi – is September early October to wet for a nice family Holiday kids ? & 7 ? Hi Justin! Even in the wet season, we did not find it rained much. The showers are heavy but over quickly. In the 6+ months we lived in Penang, it only rained for a long enough period on one day so that it affected our plans. The bigger worry is the smog at that time of year. It comes over from the fires in Indonesia and it can be very bad! To the point that things shut down and you can feel it going in your lungs. Some years, it’s not bad at all, sometimes it’s horrible. No way to judge it in advance really. Thanks for such a thorough guide Sharon. I have just booked tickets for a family holiday in Penang and it looks like there will be lots to see and do. It will be hard to narrow down the highlights for a one week stay! Thanks Melanie! We loooove Penang so much! The attractions are quite low key but that can make them more fun. The main thing I recommend is to eat a lot! It’s definitely home to some of the best food in the world. Hi Sharon, am already booked for a visit to KL. Am planning to reach KL and stay in a airport hotel and then take a flight to Penang. Would you recommend we stay in Georgetown or somewhere else. It would be my wife, and 2 kids (13 and 7). Let me say that they can have fun anywhere so just the beach may not excite them but basis your blog, I believe one can just about stay anywhere in Penang and have fun. Pls do suggest. Hi Rahul! I personally much prefer Batu Ferringhi to Georgetown. Georgetown can be quite dead in the evenings and is harder to walk around than Batu Ferringhi. There’s better accommodation options in Batu Ferringhi as well. The beach could be better so I wouldn’t recommend it for that alone, but it is an easy spot to eat and it’s close to quite a few attractions. And yay for going to Penang! Love it! Thanks Sharon! Honestly Penang was not on my radar until I read your blog. So, am reaching KL on a Sunday night and planning to stay in a airport hotel to take a morning flight to Penang. I have a return from KL after about 8 days so would spend 4 odd days in KL as well. Do you think 2 full days would be good in Penang. Also what accommodation you recommend, mi-range with family room upto say 400 MYR in Batu Ferringhi..
You left out the highest rated FB rated attraction in Penang – Tech Dome Penang, a science discovery centre at KOMTAR. Thanks so much for all the useful info. I am planning to visit Penang for the first time. We are going to stay there for only 2 days. Hence, can you please suggest us the best places to see considering the 2 days period, and also that I will be with my wife and 2 daughters (7 year old, and 2 year old)? Hi Zuhaib, very exciting! With 2 days and those ages, I would go to Penang Hill, Youth Park and Georgetown one day. The other day, I would hang around Batu Ferringhi and maybe go to the national park. 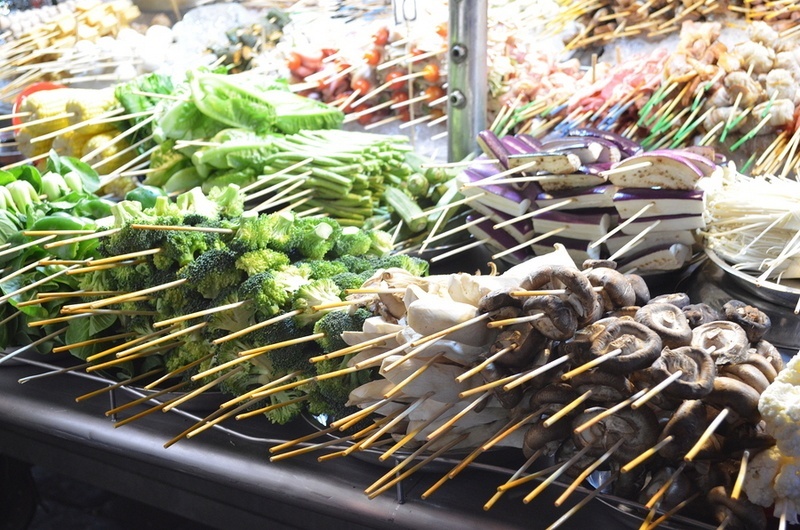 Definitely head to the night markets for dinner. Was planning to take the kids to Hard Rock Hotel on a day pass to use the swimming pools but alas they have discontinued this. So only hotel guests are allowed to use their pools. Hi, thank you for a detailed guide with great tips about things to do in Penang! My husband and I are travelling with two girls (3 years and 5 years) to Penang for 1 week in February. Would you recommend to stay ½ week in Batu Ferringhi and ½ week in Georgetown or stay the whole week in Georgetown and do day trips to Batu Ferringhi? We are planning on renting an apartment through Airbnb so we will probably not stay in any beach resorts. Hey! How exciting. We love Penang and are actually returning in March! Its a tough question. I personally much prefer Batu Ferringhi to Georgetown. It’s much easier to just hang out there too and many of the attractions are nearby. With younger kids, I’d just go the one spot as its easy enough to get between them and it’s annoying to swap accommodation. Wow so many interesting places develop in penang! i was 5 years studying in USM back then. Need to go back and enjoy those new places. 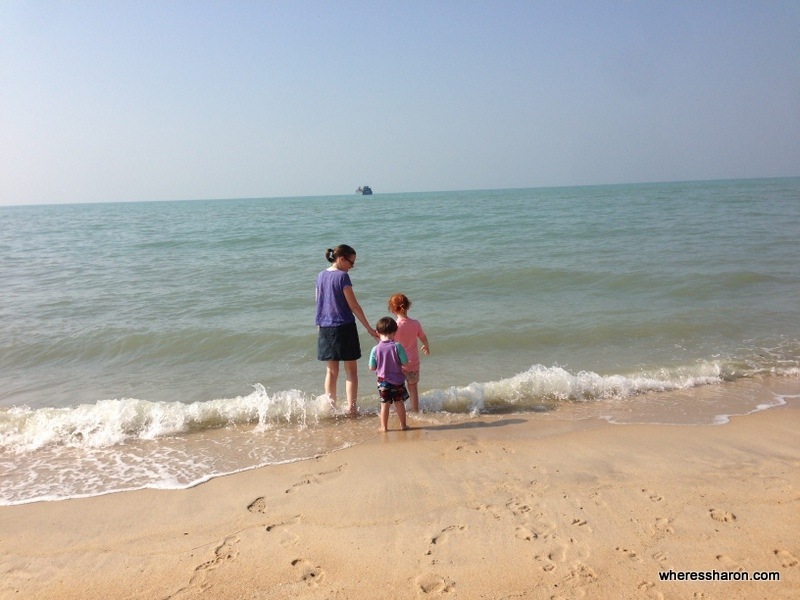 Thanks so much for sharing all of this info on your blog, we are heading over to live in Penang for 3 months with our 2 children, you have got me more excited than I was before now! It looks awesome for children! We are looking at an apartment in Batu Ferringhi when we arrive and are hoping this will be a good choice?